There are 5 stakes and 1 district located within the Japan Tokyo Mission, the Tokyo, Saitama, Chiba, Matsudo, and Kiryu stakes and a district in Niigata. An Employment Resource Center, and a few English-language wards are located in Tokyo. 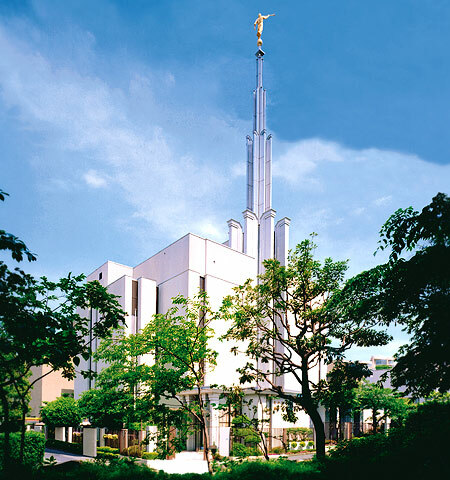 The Tokyo Japan Temple was dedicated in 1980 and is also located within the mission boundaries. A recent video series highlights the growth and strength of the Church in the Japan Tokyo area. Click here to view. Rice is a staple food in Japan, and missionaries can expect to eat a lot of it while serving in the Japan Tokyo mission! Other common food staples include soba noodles and miso soup. Since Japan is an island nation, seafood dishes (such as sushi and shrimp) are quite popular, though chicken and pork dishes are also fairly common. American restaurants are not uncommon in Tokyo, so there will still be opportunities to get some American food from time to time! Most missionaries in Japan use bicycles for transportation, though a few do get to use mission vehicles. It’s important to be aware that drivers in Japan drive on the left-hand side of the road, so traffic patterns are different than in the United States. Tokyo also has an extensive subway and train system that connects many different areas of the city. Tokyo’s public transportation system also includes buses and trams. The Yamanote train line in Tokyo. Photo cc-by-sa3.0 by LERK at Wikimedia Commons. Japan has low crime rates, however, the area is prone to frequent earthquakes. During an earthquake, you should get under a table or other sturdy piece of furniture and hang on until the shaking stops. If shelter is not available, it is best to crouch down on the ground and do your best to protect your head and neck. More information on earthquake preparedness is available at http://www.ready.gov/earthquakes. The Tokyo area has plenty of unique sites to visit, as well as several cultural festivals that are held throughout the year. Many historical sites and festivals are related to Japan’s lengthy history with Buddhism, and provide unique cultural experiences for missionaries. The Hozomon and pagodo at the Sensoji Temple in Asakusa, Tokyo. Climate: Tokyo tends to have warmer, humid summers and milder winters. Rain is common during the summer, while snowfall is rare. On the contrary, the Niigata province in the northern areas of the mission is prone to very heavy snowfall during the winter in addition to heavy summer rains. *What advice would you give to someone going to the Japan Tokyo Mission?